"...any information that eludes us, anything that's not accessible, prevents us from being perfect." Let me start here with how I felt about this book when I turned the last page and closed the cover. The words "holy sh*t" came out of my mouth, and I was tempted to go disconnect myself from every social media site I'm on. As far as the book itself, I didn't think it was perfect; in fact, it is a bit contrived, but still a very timely read, one that gave me a case of the willies. "combined everything online that had heretofore been separate and sloppy -- users' social media profiles, their payment systems, their various passwords, their email accounts, user names, preferences, every last tool and manifestation of their interests." He also invented TruYou, "one account, one identity, one password, one payment system, per person," where you had to use your real name, which "tied to your credit cards, your bank," and your personal identity, basically did away with online anonymity. TruYou is presented as a system beneficial to the customer, since he/she wouldn't have to remember multiple user names, multiple passwords, etc. In fact, everything that the company does is "beneficial" in some way, for example, microchips embedded in bone to prevent kidnappings or to easily locate missing children, other measures designed to prevent crimes, and technologies to make everyone and everything accountable via transparency provided by built-in cameras. And all the while, The Circle monitors everything that's going on, boosting the slogan "All that happens must be known." Its point of view is that privacy begets secrets, secrets beget lies, lies beget impropriety, and that the only answer is to be completely open about everything. In short, "If you aren't transparent, what are you hiding?" As Mae gets into her job, and gets sucked into the community aspect of the company, she not only gets swept up in all of The Circle's potential, but also develops her own unflinching desire for success, doing all that she can to make herself well known. Soon enough she quickly becomes a rising star with designs on getting into the top ranks. 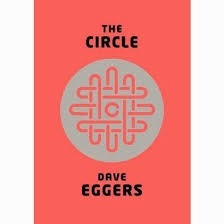 Now, if this book were only about Mae and her ambition, well, that story's been done already, but The Circle offers a look at how promises of utopia can easily turn into a nightmare. The company has designs on making things so that eventually "all government and all life" would be "channeled through one network," with no escape from being "tracked, cradle to grave." In the world of The Circle, there will be no protection -- the by-then transparent politicians who "owe their reputations" to this company could be easily ruined by getting involved against it. While I don't think this book is so great on character development or prose, it made me stop several times while reading to think about what I'd just read. I spent a lot more time thinking about it when I was finished, mainly about what the repercussions could be if technology induces us to give over all of our private information to one single entity that controls and monitors all information flow and all of our personal activities, vs the benefits that the technologies might offer. Yes, this book is didactic, and yes, there's zero subtlety here in terms of the message that is meant to come across, but it is definitely a thought provoker. This book has gotten incredibly mixed reviews, so it is one that should be judged not by other-reader opinion, but by your own reading of it. I've seen everything from "this book is utter crap" to someone calling it essential reading, so the range of reader response is huge. In my opinion, it's a very timely book to be reading right now, and if it gives you a case of the willies, it's because the future described in here should scare the crap out of you. ps/ after reading this book, I bought a brand-new copy of Orwell's 1984.